hi me again kkk 🙂 i see in my Step Drivers Pololu A4988, below show 1b, 1a, 2a, 2b i see in your silkscreen, in X axis A2 (or 2A), A1 (or 1A) , B1 (or 1B), B2 (or 2B). in same place thats will pins of pololu. This silk is motor wire order in modu connector ? or driver pin of pololu 1b conect in 2A in your board, 1A conect in A1, 1A conect in B1, 2B conect in B2? If i follow your order in board silkscreen in X axis connector, from X, leter on board i’ll have Grey (A2), Green(A1), Yellow (B1), Red (B2) its right ? or i do my modu connector following pololu driver silkscreen B1,A1,A2,B2 ? On my board the B2 and B1 pins are connected to one coil on the stepper. The A1 and A2 connected to the second coil. The pololu drivers are connected the same way. As for the stepper motor wire colours it will depend on the brand of stepper. 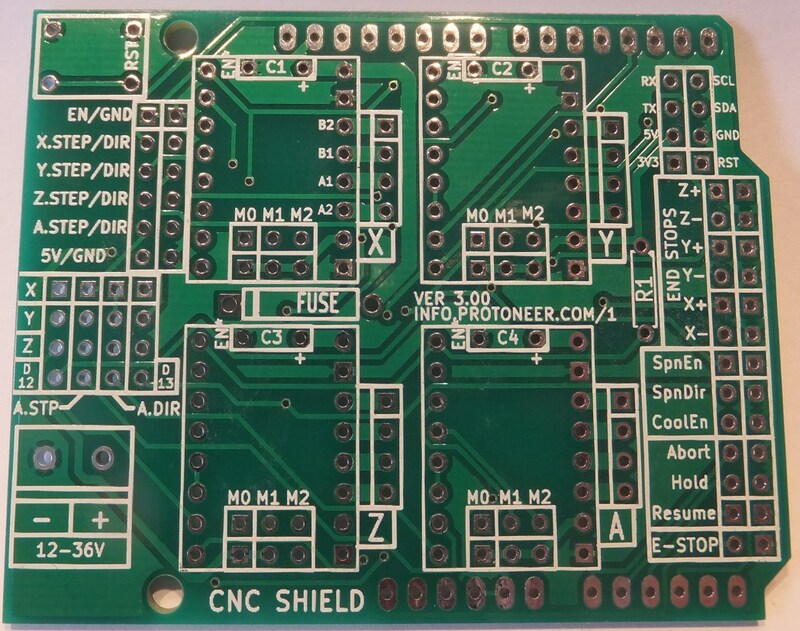 The CNC shield is compatible with these Stepper drivers and Pololu makes the rest of their stepper driver work on the same foot print(unless they say otherwise). I used the DRV8825 pin descriptions becasuse that was the lastest drivers from Pololu at the time.